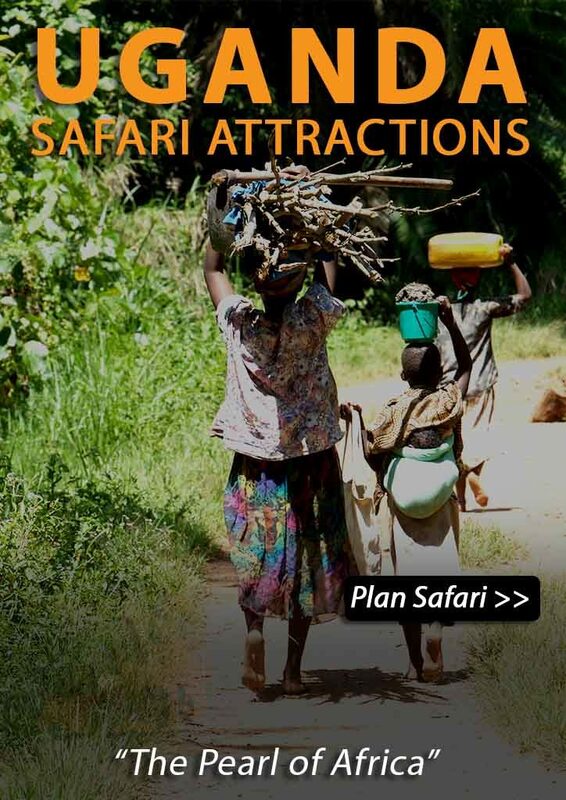 Wild African Safaris believes that this the most exiting tour you can possibly do in Uganda: Experience all highlights in combination with the very best “off the beaten track” options like Kidepo Valley and the undiscovered Karamoja region. Visit the Karamajong and Batwa (pymee) tribes. In Jinja, you will stay at The Haven – a wonderful lodge in a peaceful spot overlooking the river Nile with breathtaking views of the river rapids and excellent opportunities for watching the birds and local fishermen paddling dugout canoes. The Sipi River flows over the foothills of Mount Elgon, forming a spectacular series of waterfalls (some nearly 100m high), surrounded by village walking trails and lush green coffee-producing hills. You will stay in a wonderful lodge. From your lodge you have beautiful views over one of the waterfalls. Prepare yourself for a beautiful day in paradise. After breakfast, choose to go on a 3-hour hike through the region. A local guide accompanies you on your hike to explain flora, fauna and culture. After this experience you continue your journey to Moroto the heart of the Karamoja region where you will spend the night in a simple but clean hotel. After and early breakfast you will continue your journey to Moroto town. Matoke Tours strives to be innovative and takes its responsibility by bringing you to places where no one else will go. One of these examples is Karamoja; an area in North-Eastern Uganda where the Karamajong people live. They are related to the Maasai in Kenya and live and dress similar. The main difference is that not any other tourist is going here. Only few years ago, tourism in Karamoja would not have been possible due to armed inter-tribal conflict but nowadays it’s safe. In the early morning you leave for a scenic nature walk through the valley of Mt Moroto, the highest mountain of Karamoja. During the walk we will set camp at a traditional village of the So Tepeth mountain people. The Karamajong live in a Kraal, better known as Manyatta or Boma in Swahili. A Kraal is basically a village made out of huts surrounded by fences made of wood and thorns to keep the cattle in and to protect them against rivaling tribes and wild animals. Some of Kraals are permanent and others are temporarily as the karamajong follow the fresh grass to feed their cattle. The Karamajong are related to the Maasai in Kenya and live a similar lifestyle. The main difference is that the Karamajong is completely unknown and you are therefore sure to experience a very authentic and unique visit. In the afternoon you will visit one of the impressive Kraal or Manyatta of this community. During a night at the kraal you will experience how the Karamajong lives. They will bring their cattle back in the kraal, they will make local beer (which you can try as well ) and you can be part of the bloodletting ceremony, whereby they tap blood from a cow to drink. After the traditional goat-roast you will have some dinner for yourself. After dinner you will spend the rest of the night interacting and dancing with the Karamajong or listening to the songs next to the fire until it’s time to go to sleep. After waking up in the early morning you can see the sunrise on the Karamajong Valley and see the Shepard’s take their cattle from the kraal to look for fresh grass on the plains. Today you will travel to Kidepo valley N.P. A long but rewarding drive will take you passed one of the most beautiful scenery in Uganda. If you can plan today on a Tuesday you’ll have the chance to experience an authentic Karamajong cattle market on Wednesday (that is today in this tour). Some herders walk for 5 hours to be able to buy or sell their goats, cows or chicken here. It’s a colorful and stunning sight and one of the few remaining authentic experiences. Don’t miss this! After this thrilling experience it is time to enter into the most remote and pristine national park in the country, Kidepo Valley National Park. The park has some of the most amazing scenery in the country! For many people this is the most beautiful park of Uganda. Here you will find almost no tourists leaving you free to enjoy the park and its unique combination of wildlife without distraction. You will stay in the beautiful and newly build Kidepo Savannah Lodge. In Kidepo Valley National Park you will find zebras, giraffes, elephants, lions and leopards. This is also the only place in Uganda where you can find the cheetah and ostrich. Kidepo is famous for its lions relaxing on the rocks – a scene which may remind you of a certain Disney film. You might even be very lucky to spot a leopard or cheetah! Besides the 4×4 safaris you can also take a bush walk in the park with an armed ranger. Day 8: To Murchison Falls N.P. return back to your comfortable lodge, to enjoy a good meal and enjoy the views. The Nile Delta is the area where the Victoria Nile flows into Lake Albert. A boat safari down the river towards Lake Albert is a “must do” for every birdwatcher as the banks of the delta are home to hundreds of bird species including the rare and prehistoric-looking shoebill stork. As well you will see hundreds of hippo and maybe even bathing elephant and huge crocs. In the afternoon you can go for another game drive in the park. Or you can choose to relax at the lodge and enjoy the swimming pool. YOU’RE ONLY HALF WAY….THERE IS MORE TO COME! Day 13: Queen Elizabeth N.P. Marafiki Safari Lodge is located on a unique location and has been designed and handcrafted using local materials, fitted by artisans from the local community. 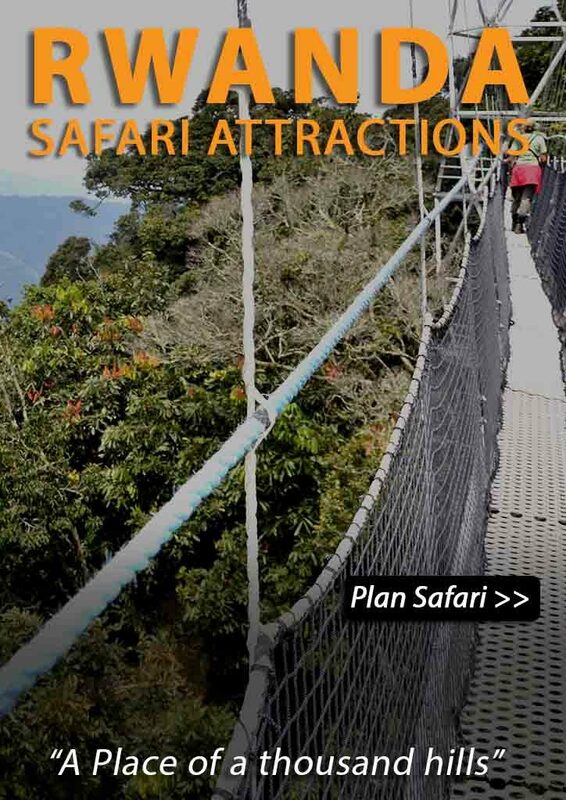 Overlooking Lake George in the Queen Elizabeth National Park it offers private safari tents on raised wooden floors and canvas walls that can be rolled up to allow you to sit comfortably watching the Savannah Plains with breath taking views across the Park and the Rwenzori Mountains. Watch wildlife from your verandah and fall asleep to the roaring of Lions on the distant savannah. This truly is Africa! 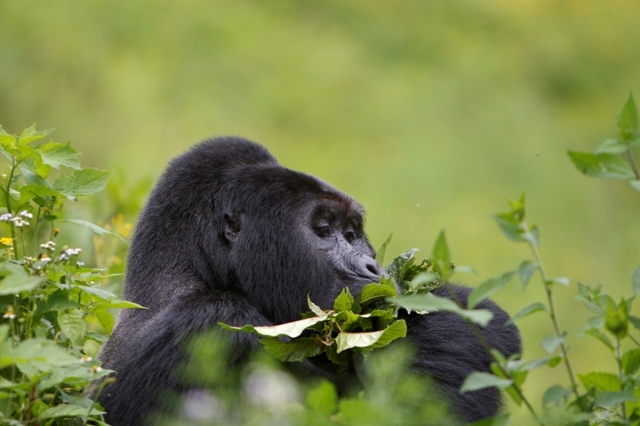 In the early morning you will visit the Kyambura Gorge. A hike through the gorge gives you the opportunity to see habituated chimpanzees and other types of primates including red-tailed monkey, black-and-white colobus, baboons and vervet monkeys. Although the chance of spotting chimpanzees is only 50%, the landscape is among the most impressive in Uganda and is absolutely worth it! After this amazing experience you will continue your journey. Your accommodation for tonight is the Enjojo Lodge, which is surrounded with acacia forest, lush vegetation with palm trees and scattered grasslands. Find birds, monkeys, and other wildlife around your cottage! When you are interrested in tribes/ culture you should not miss this: A new tourism trail, result of a collaboration between the Uganda Wildlife Authority and the United Organisation for Batwa Development in Uganda, is helping the indigenous Batwa pygmy people to keep their culture alive, following their eviction from the forests of southwest Uganda more than two decades ago. The Batwa are Uganda’s traditionally forest-dwelling pygmy people. About a century ago, there was a conflict between the Batwa and the Bantu speaking people in the region. The Bantu tried to expel the Batwa people from the area, so they hideout in Garama Cave. The Bantu had no idea there was a hidden cave in the forest and therefore could not find the crafty Batwa. Your guide will explain how the Batwa lived and fought out of this cave. The cave is 342 meters in length and 14 meters deep, and is now only inhabited by bats, The walk to and from the cave passes through mountain woodland with plenty of opportunity to enjoy the scenery or watch birds. 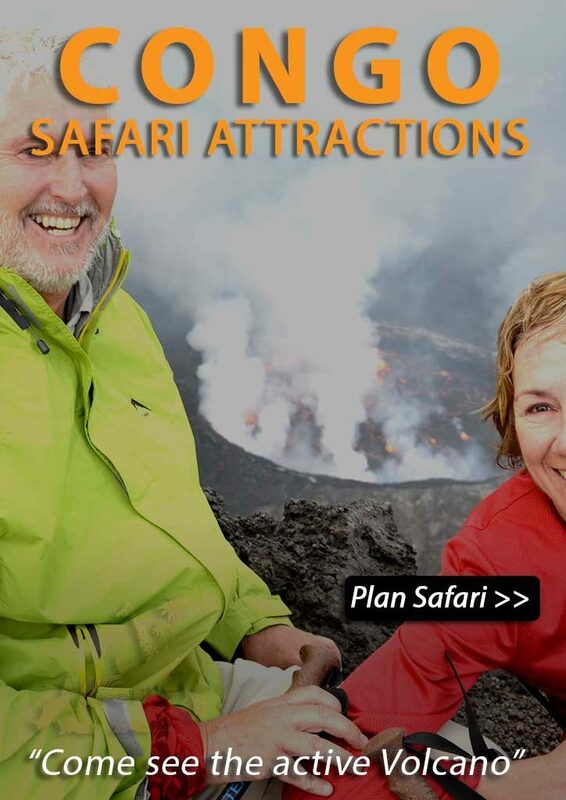 Our standard offering for 1 or 2 persons for this specific tour is a 4wd ToyotaLandcruiser Prado or Nissan Patrol with pop-up roof for easy safari viewing. All passengers will have a dedicated window seat. When you are 3 or 4 persons the bigger moddel is included as listed in the first upgrade option at no additional costs. The extra costs for this option is $50 per day extra. The extra costs for this option is $120 per day extra. (divided by number of persons traveling). These costs don’t apply when you are traveling with 6 – 7 persons, as this car will be included.